Wonderful winter flowering Iris species. 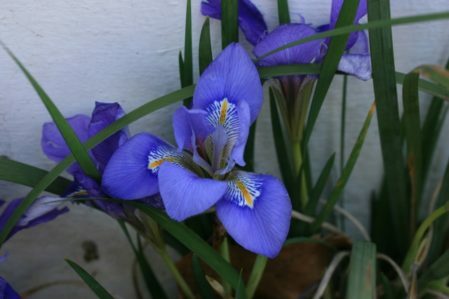 Iris lazica is closely related to Iris unguicularis but has deeper blue flowers and glossy green leaves. Unlike the sun loving I. unguicularis I. lazica thrives in part shade and does well in heavier soils. It flowers December-March. Ideal planted against a North wall where it will provide good evergreen ground cover. Elegant scented mauve flowers. Glossy green foliage. Tidier than I. unguicularis foliage. Ht. 30cm. Sp. 30cm. Will grow in shade and tolerates clay. Beware of slugs. It is a great joy to pick the flowers in winter in bud and watch them unfurl in the warmth of the house. Looks wonderful as a cut flower with a few short stems of Jasminum nudiflorum. 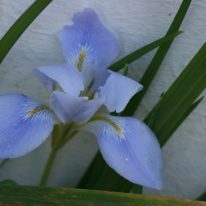 Iris lazica, although comparatively rare, is a very easy and rewarding plant. It is free of all diseases and clumps up readily.